Eastern Mennonite University men’s volleyball player R.J. Ocampo (Virginia Beach, Va./First Colonial) had an incredible opportunity this summer before gearing up for his senior season with the Royals. 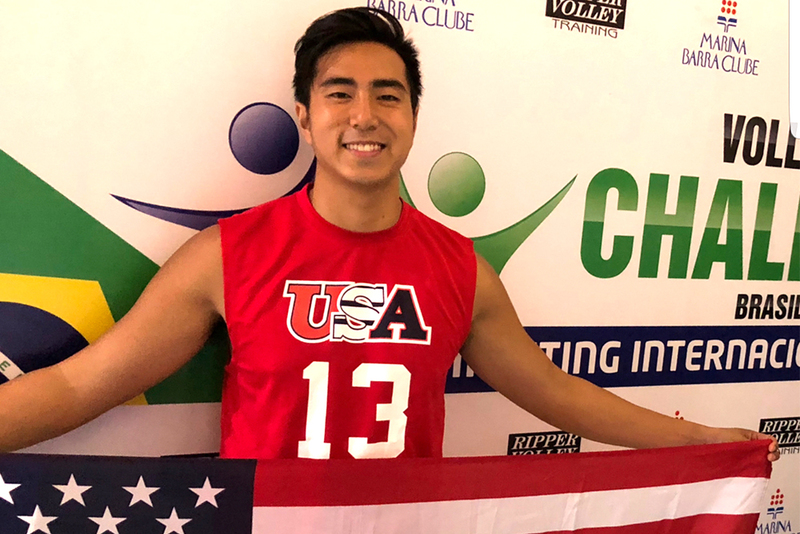 Ocampo spent over a week in Brazil on the USA D-III Volleyball Team representing his country, his sport, and his school. Ocampo, a three-year starter at middle hitter for Eastern Mennonite, travelled to Brazil June 11-20, playing volleyball and learning about the culture. Initially, Ocampo was connected to the touring group of USA Sports from EMU classmate Christian Taylor (Richmond, Va./Deep Run), who participated in a similar tour last summer. From there, the select team was made up of NCAA Division III volleyball players from throughout the United States based off recommendations of coaches with Ron Smith, the director of the program from USA Sports Tours & Events, making the final invitations. Ocampo is the third Royals athlete to play in Brazil over the past two summers. The men’s and women’s USA D-III Volleyball Teams travelled together, with each roster limited to 10 players. The men hailed from six different schools and seven different home states, while the women represented seven institutions and eight home states. This past spring, Ocampo helped lead Eastern Mennonite to the semifinals of the Continental Volleyball Conference Tournament. He finished his junior season with 149 kills and 106 blocks, and is already sixth in program history with 245 career blocks. The tour started out in Jundiai, where the USA team played two matches against the city’s club team. The team then traveled to Rio de Janeiro where they stayed on the famous Copacabana Beach. Between practices and matches, the team was able to experience educational, cultural and social aspects of Brazilian life through city, school and sports club visits. Joining players from other high profile programs, such as Continental Volleyball Conference rivals Kean and Juniata, elevated Ocampo‘s play. He also noted that the international experience gave him a new appreciation for his sport.